I feel honored to be published in DODHO Magazine, next to some great artists that I admire very much. Many thanks to Máximo Pranes and the Dodho team. 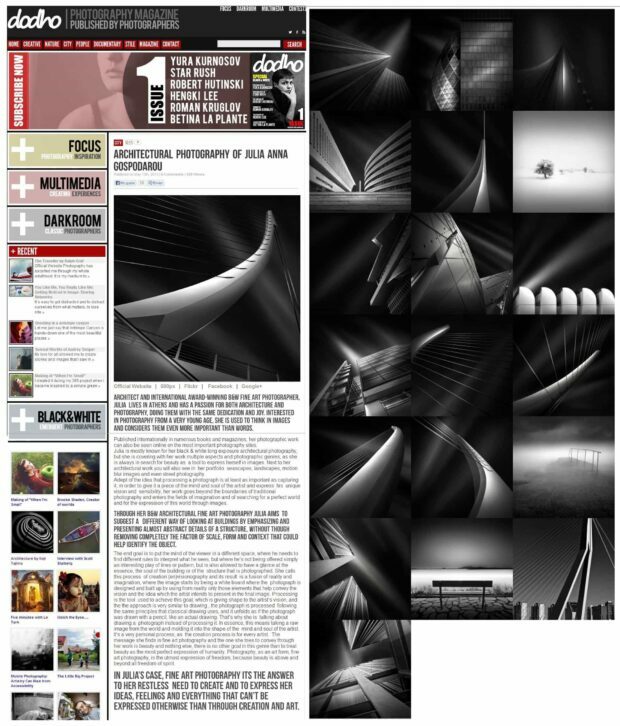 “Architect and International Award-Winning B&W Fine Art Photographer, Julia lives in Athens and has a passion for both architecture and photography, doing them with the same dedication and joy. Interested in photography from a very young age, she is used to think in images and considers them even more important than words. Published internationally in numerous books and magazines, her photographic work can also be seen online on the most important photography sites. Julia is mostly known for her black & white long exposure architectural photography, but she is covering with her work multiple aspects and photographic genres, as she is always in search for beauty as a tool to express herself in images. Next to her architectural work you will also see in her portfolio seascapes, landscapes, motion blur images and even street photography. Adept of the idea that processing a photograph is at least as important as capturing it, in order to give it a piece of the mind and soul of the artist and express his unique vision and sensibility, her work goes beyond the boundaries of traditional photography and enters the fields of imagination and of searching for a perfect world and for the expression of this world through images. Through her B&W architectural fine art photography, Julia aims to suggest a different way of looking at buildings by emphasizing and presenting almost abstract details of a structure, without though removing completely the factor of scale, form and context that could help identify the object. The end goal is to put the mind of the viewer in a different space, where he needs to find different rules to interpret what he sees, but where he’s not being offered simply an interesting play of lines or pattern, but is also allowed to have a glance at the essence, the soul of the building or of the structure that is photographed. She calls this process of creation of (en)visionography and its result is a fusion of reality and imagination, where the image starts by being a white board where the photograph is designed and built up by using from reality only those elements that help convey the vision and the idea which the artist intends to present in the final image. Processing is the tool used to achieve this goal, which is giving shape to the artist’s vision, and the approach is very similar to drawing , the photograph is processed following the same principles that classical drawing uses, and it unfolds as if the photograph was drawn with a pencil, like an actual drawing. This is why she is talking about drawing a photograph instead of processing it. In essence, this means taking a raw image from the world and molding it into the shape of the mind and soul of the artist. It’s a very personal process, as the creation process is for every artist. The message she finds in fine art photography and the one she tries to convey through her work is beauty and nothing else, there is no other goal in this genre than to treat beauty as the most perfect expression of humanity.